A hybrid of old and new technology: A resistive touch screen over a sketched / printed 'keyboard' layout provides flexible input options. Getting rid of physical buttons and have unlimited entry options - that's what this is all about. 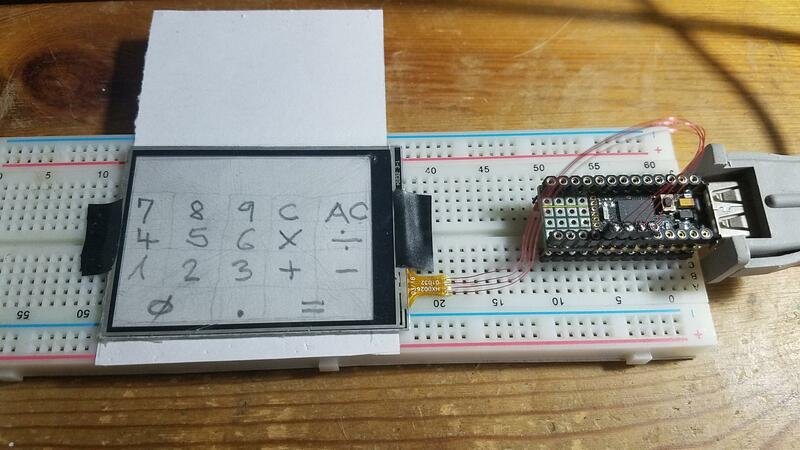 Here is my universal Espruino (PICO) keyboard. A few modules including a configuration module make a simple calculator entry. PS: Configured screen resolution is 142 W x 104 H spots (pixels), 0/0 is at left (x) top (y). Reasons for chosen resolution will be subject of another conversation. What about this one? Is it similar to the one you use ? buydisplay is the source of (almost) all my displays, since I do not need the fruity, access easing surroundings (from adaFruit... I though admit that my first add-ons when getting started with Original Espruino board came from adafruit: display w/ resistive touchscreen (no touch screen controller), wifi CC3000 board, and possibly M6 uBlox GPS). Looks great! Do you have links to your touchRD and touchKey modules? TouchRD Documentation includes generic code for calibration for Portrait and Landscape use.